Lil Country Librarian: Five Super Leprechauns Shared Reading, Finger Puppets and More! 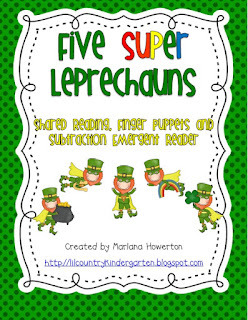 Five Super Leprechauns Shared Reading, Finger Puppets and More! If you need a fun and fast last minute St. Patrick's Day activity, I just created Five Super Leprechauns for St. Patrick's Day subtraction! You get the following items: Shared Reading (color and black/white), Retelling Finger Puppets and a subtraction Emergent Reader. Click on the picture below to take a peek! Super cute Marlana! I love your finger puppets!